From The Blaze September 26, 2011. 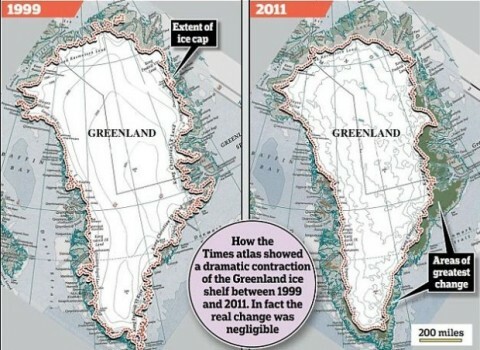 “Over the last couple weeks, climate scientists have been trying to get ice added back onto the map of Greenland in the latest version of the Times Comprehensive Atlas of the World. Glaciologists came out in force stating the publisher exaggerated the rate of glacial melt and that scientists were not consulted about the figures. But only a day later, HarperCollins’ subsidiary Collins Geo issued an apology saying that the press release with the 15 percent reduction was wrong, although they did not acknowledge that the map itself was inaccurate. From American Family Association September 28, 2011. “Iranian Pastor Yousef Nadarkhani is currently on trial in Rasht, Iran. He has appeared in court three times this week and each time has refused to renounce his faith when asked to do so by the court. If he does not recant his Christian faith, he could be executed at any time (on or after Thursday, September 29). The 11th branch of Iran’s Gilan Provincial Court has determined that Nadarkhani has Islamic ancestry and therefore must recant his faith in Jesus Christ. Send an email to the Secretary of State Hillary Clinton, asking her to request the Iranian government to stop any attempt to execute Pastor Nadarkhani and to offer asylum to Pastor Nadarkhani and his family. Speaker of the House of Representatives John Boehner has also released a statement calling for Pastor Yousef’s release. As I have stated before, the first letters in Wells are WE. This has always been a group effort and will continue that way. Below are 2 comments from regulars here. I wish that the rest of the country was paying this much attention. From Bessie on 2011/09/28 at 8:00 pm. there”…third, the leaker??? was it someone inside the fbi or U.S.
called to testify and him waiting for over 3 years to be sentenced. From Pete on 2011/09/29 at 12:54 pm. “I read a little background about our mutual prosecutor Fitzpatrick the other day. Seems he was famous before being involved in the Chicago crime, we call Obama’s past. Fitzgerald brought a guy in to testify for a grand jury, knowing the whole time that the person he was interviewing had nothing to do with the crime he was investigating. He did this to ‘entrap’ the witness. The witness was Scooter Libby, and he didn’t have ANYTHING to do with Valerie Plame or her public outing at the hands of a Colin Powel aid. So, we know that Fitzgerald is a political hack for the DEMOCRATS and has no interest in unbiased justice. He is directly INVOLVED in cover-up for Obama and his associations with Blago, Levine, the hospital board, the sale of the illegal senate seat, his illegal housing gift from Rezco, and some 600 million dollars of Iraq reconstruction aid that went mysteriously missing. Here is a decent overview of the William Cellini trial. I stated in 2008 before the election that Obama had to win to avoid prosecution. Since taking the White House he has controlled Eric Holder and the US Justice Department. Obama may lose control of Holder for a number of reasons. Many rumors are circulating about Obama not running in 2012 or having competition in the primaries. I posed the question months ago of who would throw Obama under the bus. At this point I give it a 50 50 chance of his running in 2012. He still has some of the same problems of actually being investigated for a number of indiscretions. So Obama will have to work out a deal with someone(s). Watch closely. This may happen. From Illinois Pay To Play September 28, 2011.
admission from the Complicit Newspaper. article written by David Jackson. property developers secure multimillion-dollar mortgage loans. Sources said Thomas also logged frequent visits to Rezko from Gov. were among the many politicians for whom Rezko raised campaign cash. redeem himself in the eyes of business associates and his family. that you and Rezko spoke on the phone daily. Is that true? perhaps, there was another reason. As most of you know, the Citizen Wells blog has stated that Patrick Fitzgerald has been protecting Obama for some time and should have prosecuted Blagojevich much sooner. Patrick Fitzgerald is just as guilty of corruption as those he prosecutes. I could prove this in a court of law. A status hearing for the William Cellini trial is scheduled for today, Wednesday, September 28, 2011, in the court of Judge James B. Zagel. Chicago and Illinois delays in sentencing, Rezko Blagojevich Ryan, Will Tony Rezko testify? From the Chicago Tribune September 27, 2011. “George Ryan: 142 days. The former governor was found guilty in 2006 of more than a dozen felony charges, including racketeering, tax and mail fraud and lying to the FBI. He is in prison. Why has the sentencing of Tony Rezko been delayed over 3 years without his being called as a witness? Tagged Chicago and Illinois delays in sentencing, Rezko Blagojevich Ryan, Will Tony Rezko testify? From World Net Daily September 26, 2011. “President Obama’s nominee for Commerce secretary served as chairman of the board of a solar energy company that recently received a $1.37 billion federal loan guarantee – the largest the Department of Energy has ever given for a solar power project. Now that company, BrightSource Energy, is attempting to build the world’s largest solar power plant amid concerns such ventures may be too risky an investment for the federal government. In June, BrightSource Chairman John Bryson was nominated by Obama to head the Commerce Department. WND reported in June that Bryson co-founded an environmental activist group that is a member and funder of the controversial Apollo Alliance. Read what we’ll need to accomplish to restore America to greatness. Apollo is run by a slew of socialists and radicals, including Jeff Jones, a founder of the Weather Underground domestic terrorist organization. Jones himself boasts of doing work for the environmental group founded by Bryson, the Natural Resources Defense Council. Bryson served until June as co-chairman of the Pacific Council on International Policy, a globalist organization whose members can be found throughout the Obama administration. The massive loan guarantee to BrightSource is meant to build an expensive California desert solar plant known as the Ivanpah Solar Electric Generating System. The system will feature mirrors that reflect sun toward a massive central tower that is in turn heated to produce steam meant to spin turbines to produce electricity. The size of the BrightSource plant is thought to produce enough power to meet the needs of hundreds of thousands of Californians. However, some have doubted that the massive solar plant will actually work. The Bay Citizen quoted Michael Boyd, president of the nonprofit Californians for Renewable Energy, as saying there is “no evidence” BrightSource’s project will succeed. Boyd complained most of the equipment used at the plant would be manufactured in China and Germany. “In 1970, Bryson co-founded the Natural Resources Defense Council, or NRDC, with a $400,000 seed grant from the Ford Foundation. The group is also funded by the Tides Foundation, to which philanthropist George Soros has donated more than $7 million over the years. Tides itself is a major funder of leftist causes, including ACORN, whose founder and former chief organizer, Wade Rathke, is a Tides board member. The NRDC is a major proponent of fighting so-called global warming. It recently endorsed a document called the Earth Charter, which, Discover the Networks notes, blames capitalism for many of the world’s environmental, social and economic problems. The NRDC endorses many Apollo initiatives. Apollo’s New York office is run by Jeff Jones, who founded the Weather Underground with terrorists Bill Ayers and radical Mark Rudd when the three signed an infamous statement calling for a revolution against the American government inside and outside the country to fight and defeat what the group called U.S. imperialism. Jones currently boasts on his personal website that he has done consulting work for the NRDC. Apollo has been credited by the Obama administration with helping craft portions of the $787-billion “stimulus” bill signed into law. The Apollo Alliance has boasted in promotional material that it was behind several of the Obama administration’s “green” initiatives, in addition to crafting “green” sections of the stimulus bill. •Van Jones, President Obama’s controversial former “green jobs czar” who resigned in September 2009 after it was exposed he founded a communist revolutionary organization and signed a statement that accused the Bush administration of possible involvement in the 9/11 attacks. Jones also called for “resistance” against the U.S.
•Joel Rogers, a founder of the socialist New Party. WND reported evidence indicating Obama was a New Party member. In an interview with WND, New Party co-founder and Marxist activist Carl Davidson previously recounted Obama’s participation with the New Party.